The new tablet client for Dynamics CRM 2013 has a fantastic looking multi-entity search but it is not yet available in the Web Client. 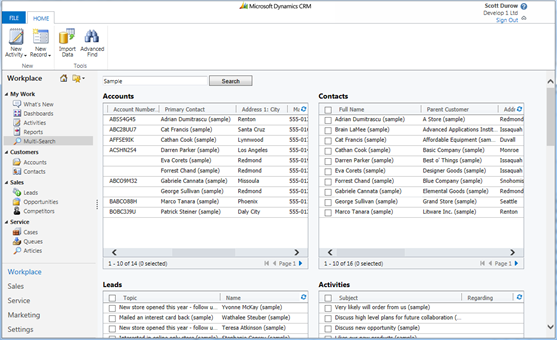 I thought this would be a good opportunity to create another SparkleXRM sample to achieve a similar feature with Dynamics CRM 2011. Once installed, it creates a sitemap entry that runs shows the Multi Entity Search HTML Web resource. By default, it'll show the Account, Contact, Lead, Activity & Opportunity entities, but can show other entities by passing parameters. Each entity grid shows the 'Quick Find' view for the given entity and displays the head and column names in the user's chosen language. The grids are fixed widths, but will wrap according to the screen width available. Using the Metadata Query SDK to retrieve entity & attribute types and display names in the user's chosen language. Grids displaying the page size defined in the user's settings. Rendering grids with clickable links to entity records.